In my 20 years following the custom furniture business, I’ve seen how hard it is to stay afloat building and selling pieces with the hallmarks of fine handcrafted work: carefully chosen and surfaced hardwoods, tasteful design, traditional joinery, and an uncompromising finish. These days, most people just don’t want to pay for or own heirloom pieces made to last 100 years or more. One- or two-person operations sometimes pull it off, and very occasionally, production shops are successful on a larger scale. One is Thomas Moser, headquartered in Maine with showrooms on both coasts. I didn’t really know another one, until now. On assignment for Woodcraft magazine, I was invited to visit The Joinery, a small furniture factory in Portland. I had wandered by one of the showrooms before, impressed by the quality of work inside, but I didn’t really know the deal. Was it a consignment/gallery operation, showcasing the work of dozens of local craftsmen, or something else? The Joinery’s main showroom and workshop are in the Woodstock neighborhood of SE Portland. A downtown Portland showroom gives the company even greater visibility. The Joinery is definitely something else. Started as a one-man shop in 1982, focusing on furniture repair, The Joinery soon shifted to making new pieces, with the uncompromising quality espoused by a new generation of woodworkers. By designing broadly appealing furniture, mostly updated versions of classic Shaker and Mission designs, The Joinery was able to create lines and repeat the same pieces, varying only the woods used and a dimension here and there, letting them create jigs and fixtures to speed up the work and lower the price points without compromising quality. Heirloom furniture is not cheap, but it’s a lifetime investment in something made locally and made well. The founder retired three years ago, and the new owners have taken the business to a new level, retiring less popular designs, adding hip new ones in the Mid-Century Modern mode, and using technology to produce easily customized blueprints and parts lists, track inventory, and so on. I love this elegantly simple chair, with a rounded seat cushion that echoes the shape of the solid back. Through it all, they have never veered away from the company’s unique selling proposition: handcrafted pieces, each made by a single craftsman, ensuring uncompromising quality at every stage, with a lifetime guarantee for structural integrity. Getting a job as one of those well-paid makers is not easy. You have to be very quick and very good, and the craftsman hail from around the world, including one from Tibet. As a reward, they receive an endless stream of work, regular hours and a regular paycheck, with the marketing and accounting all handled by someone else. It’s a fine woodworker’s dream come true. What clients get is world-class furniture in gorgeous woods, like live-edged walnut and spalted maple, designed and built to pass the test of time, with a lifetime guarantee to insure their investment. As the former editor of Fine Woodworking, I was flattered and charmed to see a design aesthetic torn right out of the magazine’s 40-year archive, without copying any particular pieces or designs directly. In my heart, I always knew someone could do it on a large scale. The Joinery has. The Joinery uses only hand-selected, sustainably harvested hardwoods. A massive library of custom jigs makes it possible to repeat a wide range of pieces very efficiently. Designs are simple and tasteful, showcasing gorgeous materials and flawless craftsmanship. The old two-story factory building is filled with spaces large and small for staging furniture in typical room settings, only adding to its appeal. 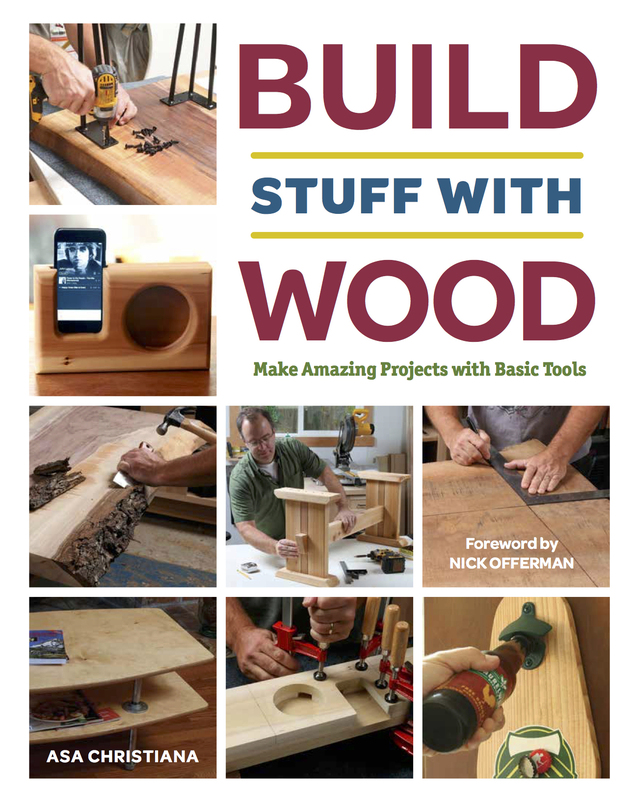 ← Build Stuff, the book, finally arrives!